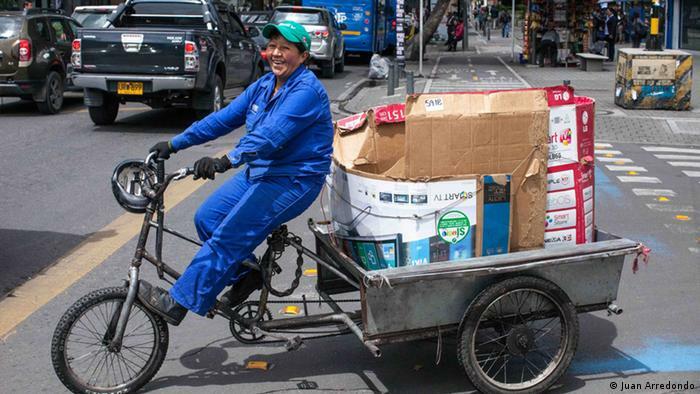 Once marginalized and banned from collecting recyclables on city streets, Bogotá’s waste-pickers are now constitutionally protected, and act as role models for other informal recyclers around the world. Nohra Padilla was 7 years old when she began working at the foot of a municipal landfill in the Colombian capital, Bogotá. 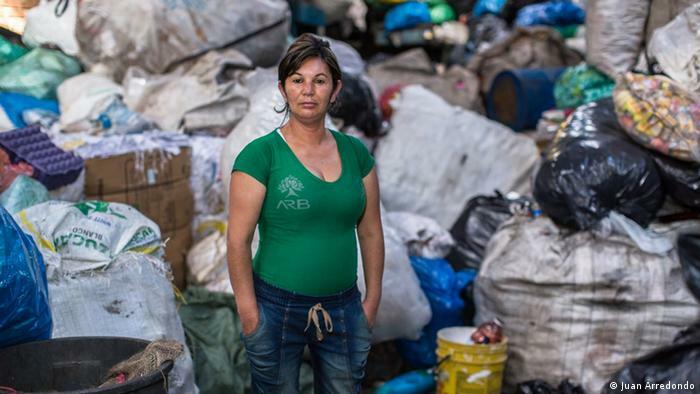 Every day, she sifted through mountains of trash to find plastic, metal and other scrap materials to sell, contributing to what had become her family’s livelihood after fleeing violence in rural Colombia. When the dump shut down, the Padilla family – like other trash collectors – took their work to the city’s streets – but they faced daily discrimination. Colombia’s government favored large corporations it considered more efficient and sanitary – if less environmentally friendly. It passed a series of laws prohibiting waste-picking. In 1991, Padilla and other community waste pickers formed the Association of Recyclers of Bogotá (ARB) to safeguard themselves and fight for legal recognition – which they gained in a landmark court battle in 2013. “After 30 years of organizing and working for visibility, Bogotá’s recyclers are recognized as having rights equal to other workers,” says Padilla, who is now 49 and director of ARB. In 2013, Padilla received the Goldman Environmental Prize, the largest international award for grassroots environmental activism. Since winning the case, waste-pickers registered in the city are paid bimonthly at authorized weighing centers for each ton of collected material. They are also able to sell the waste on the open market. As a result, many have seen their earnings double or triple. The gains made by Bogotá’s 21,000 recicladores (waste-pickers), says Padilla, have turned them into role models for other informal trash collectors around the globe. Around 1 percent of the urban population in developing countries earns a living through this work, according to World Bank estimates. Waste-pickers often live in extreme poverty with little to no employment rights – and yet, they play a key role in the economy, and help the environment. In Bogotá – a rapidly growing megacity of nearly 8 million people – waste-pickers collect around 1,200 tons of waste daily, according to a 2015 case study. They divert recyclables away from Doña Juana, Bogotá’s only and nearly full landfill, dropping them off at recycling centers around the city. The recyclers supply a steady flow of materials to Colombian businesses. Recyclables such as water bottles are sometimes sold to companies, where they are used to produce similar products, or even jeans and other apparel. In addition to helping the economy, this also reduces greenhouse gas emissions by cutting waste and preventing exploitation of virgin raw materials. “The experience we have from all the countries of the developing world is that without waste-pickers, recycling doesn’t thrive because the systems in place cannot cope,” says Sonia Maria Dias, a sociologist and waste specialist in Brazil. Such developing countries turn to air-polluting incinerators instead – which “makes no sense,” says Dias. A majority of domestic waste produced in the Global South is organic or reusable and doesn’t need to be burned, she adds. Burning recyclables such as plastic can emit dioxins, a carcinogen that remains in the environment for long periods of time. Non-recycled items can also end up in the water supply – or in natural habitats, threatening biodiversity. While the government and public have slowly started to recognize these environmental and economic benefits, self-organizing has changed the way waste-pickers see themselves. ARB helps formally train its members in technical and safety standards. It also runs leadership seminars – particularly for the women who make up 31 percent of waste-pickers in Bogota. “ARB has given waste pickers a new self-perception: ‘You are not only a waste picker. You are environmental agents, and also a provider of a public service,'” says Federico Parra, a Latin America regional coordinator with activist and research network Women in Informal Employment: Globalizing and Organizing, an ARB partner. Still, the recyclers have to fight to retain the gains made in 2013. 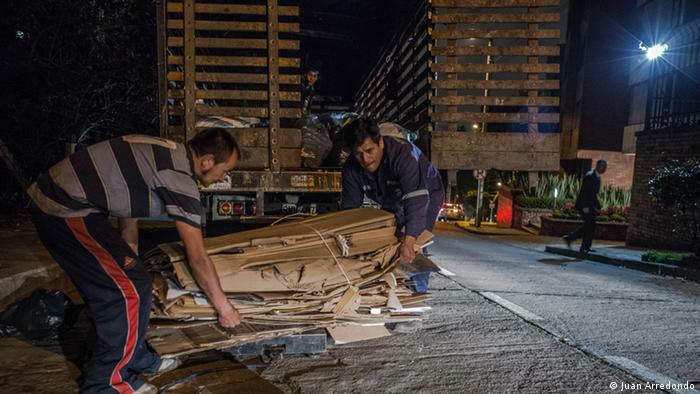 Recently in Bogotá, ARB waste-pickers took to the streets to protest the new city government’s proposals to scrap the current waste collection system for a more technologically advanced one. The waste-pickers won out. ARB, now one of several waste picking organizations in Colombia, also faces pushback from pervasive and powerful economic interests. Padilla has received threats over the phone, and from armed men. She’s also had her computer and identification documents stolen. But the ARB has seen success in convincing Colombia’s government to adopt a waste management decree that includes the recicladores, and is working with 12 cities in Colombia in order to implement it. It has also inspired waste-picking movements in countries such as Ecuador, Argentina and South Africa. Critics continue to call waste-picking an antiquated model, which should be replaced with modern technologies. But modern technology can also be human-driven and have minimal environmental impact, says Padilla. For instance, waste-pickers in Bogotá now have official maps they use to comb every corner of the city for precious trash – usually with a hand-pushed cart called a zorro (fox). Unlike modern garbage trucks, such carts don’t emit pollution – although, ARB does use some trucks to collect recyclables from their members.